The Future of Love Will Certainly Be Just Like This. Ahem. Jonathan Coulton’s song “The Future Soon” is a sly commentary on our romantic dreams of a better future. So what will romance be like when we all have HUDs (“Heads-Up Displays”) in our contact lenses, or glasses, if you’re (new) old-school? “Oh, really, you grew up in Soho? Hm, not according to your online profile. Ah, I see you used to belong to alt.nosebeeping. Um, bye.” Off we go to an info-packed future where everything you ever posted follows you like an embarrassing old friend. Omnipresent connectivity aside, an unloved dork can certainly be excused for looking forward to his enhanced —and irresistible – future self. Or maybe it’s just that resistance will be futile. 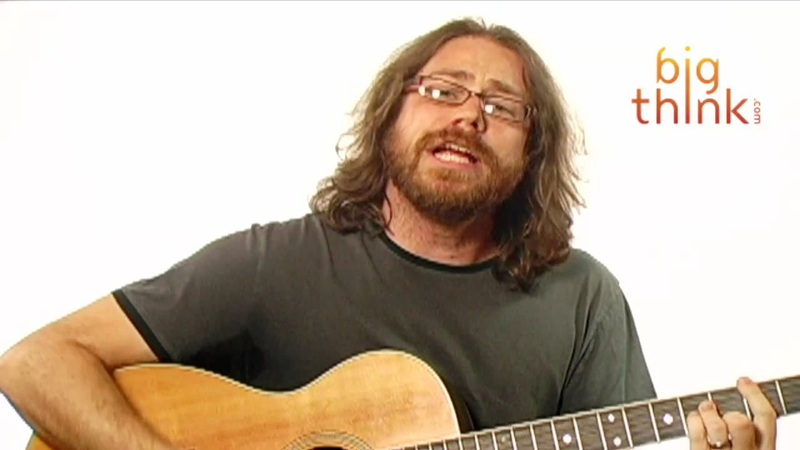 Jonathan Coulton’s songs offer a unique, and sly, form of commentary on what it’s like to live on the cusp of a very different-looking future. He’s got a massive repertoire of tech-aware tunes, and a well-deserved and rabid following. His music is funny, touching, and, as much as anything else, smart.